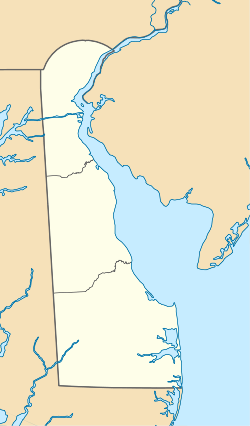 Location of Odessa in New Castle County, Delaware. Odessa was originally known as Cantwell's Bridge. In 1721, a son of Captain Edmund Cantwell opened a toll bridge over the Appoquinimink Creek at this location. Cantwell's Bridge became an important port that shipped wheat, corn, tobacco, and produce down the creek to the Delaware Bay, where it traveled to distant ports. The town was also home to tanneries that produced leather goods. Cantwell's Bridge would continue to prosper as an agricultural port into the 19th century. In 1855, the grain trade collapsed after the Delaware Railroad was built to the west through Middletown. The railroad was originally proposed to be built through Cantwell's Bridge but the merchants and vessel owners in the town opposed. Following this, the town was renamed to Odessa after the port city of Odessa in Russia (now a part of Ukraine) in an effort to keep the town alive as a major port. The town saw a slight boom during the American Civil War. Odessa is located at 39°27′26″N 75°39′41″W﻿ / ﻿39.45722°N 75.66139°W﻿ / 39.45722; -75.66139 (39.4573340, -75.6613184), along the Appoquinimink River. According to the United States Census Bureau, the town has a total area of 0.4 square miles (1.0 km2), of which, 0.4 square miles (1.0 km2) of it is land and 2.22% is water. As of the census of 2000, there were 286 people, 119 households, and 84 families residing in the town. The population density was 652.6 people per square mile (251.0/km²). There were 127 housing units at an average density of 289.8 per square mile (111.4/km²). The racial makeup of the town was 94.06% White, 5.24% African American, 0.35% Pacific Islander, and 0.35% from two or more races. Hispanic or Latino of any race were 1.05% of the population. There were 119 households out of which 27.7% had children under the age of 18 living with them, 54.6% were married couples living together, 12.6% had a female householder with no husband present, and 29.4% were non-families. 22.7% of all households were made up of individuals and 10.9% had someone living alone who was 65 years of age or older. The average household size was 2.40 and the average family size was 2.80. In the town, the population was spread out with 19.9% under the age of 18, 5.9% from 18 to 24, 26.9% from 25 to 44, 29.4% from 45 to 64, and 17.8% who were 65 years of age or older. The median age was 42 years. For every 100 females, there were 95.9 males. For every 100 females age 18 and over, there were 90.8 males. The median income for a household in the town was $53,269, and the median income for a family was $55,938. Males had a median income of $31,875 versus $33,750 for females. The per capita income for the town was $27,662. None of the families and 3.2% of the population were living below the poverty line. U.S. Route 13 is the main north-south route in Odessa, passing through the town along Dupont Parkway, which follows 5th Street northbound and 6th Street southbound. Delaware Route 299 is the main east-west route in Odessa, passing through the town along Main Street. The Delaware Route 1 toll road passes to the west of Odessa and has an interchange with DE 299 that serves the town. DART First State provides bus service to Odessa at a park and ride lot west of the town near the interchange between DE 1 and DE 299. The park and ride lot serves the Route 43 bus to Middletown, the Route 45 bus to Wilmington, the Route 301 bus to Wilmington and Dover, and the seasonal Route 305 "Beach Connection bus to Lewes and Rehoboth Beach. Delmarva Power, a subsidiary of Exelon, provides electricity to Odessa. Chesapeake Utilities provides natural gas to the town. Trash and recycling collection is provided by the town. ^ "Odessa". Geographic Names Information System. United States Geological Survey. ^ DeLorme (2004). Maryland Delaware Atlas & Gazetteer. p.78. Yarmouth, Maine: DeLorme. ISBN 0-89933-279-X. ^ "Service Territory". Delmarva Power. Retrieved August 15, 2017. ^ "Yard Waste Disposal". Town of Odessa, Delaware. Retrieved June 30, 2018. Wikimedia Commons has media related to Odessa, Delaware. Parry, Albert (Spring 1944). "US towns named Odessa". Russian Review. 3 (2): 36–40. doi:10.2307/125407.